The Commission updated the Hawaii Drought Plan in 2017. The Plan continues to emphasize mitigation and preparedness. Revisions to the Plan include a new section on climate change, simplified drought risk maps, refinement of drought communication protocols and recommended response actions, discussion of fresh water public trust purposes, and descriptions of drought declarations for different jurisdictions. Procedures for assessing drought conditions and drought communication guidelines are reviewed. Recent Hawaiian drought events are listed along with federal assistance information and actions taken to mitigate drought across the state. The Plan also renews recommendations and priority implementation actions. A comprehensive rainfall pattern and climate monitoring system to provide early warning of emerging droughts to decision makers, stakeholders, and the general public. A network of people and/or organizations who can effectively assess evolving impacts of water shortages on agriculture, recreation, hydropower, municipal and domestic water supplies, wildlife, and other areas that are sensitive to reduced rainfall and fluctuations in water supply. Clear policies and establishment of response entities to implement immediate and short-term response measures to reduce drought impacts and longer-term mitigation measures to reduce the future impacts of drought. 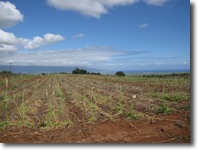 The Hawaii Drought Plan should also include a description of historical occurrences, climatological statistics, risk assessments of susceptibility and vulnerability to drought, as well as identification of potential impacts related to specific geographical locations. The plan emphasizes identification of pre- and post-drought preparedness and mitigation measures for implementation by government agencies, stakeholders, and the general public. The Hawaii Drought Plan establishes a leadership structure comprised of the: 1) Hawaii Drought Council; 2) State Drought Coordinator; 3) Water Resources Committee; and 4) County/Local Drought Committees. Participation in these groups is designed to include, but not be limited to, individuals and/or organizations that can best share their expertise and familiarity about local issues, resources, and priorities regarding drought preparedness and response. Perhaps, more importantly, membership in these committees should be comprised of individuals who can effectively communicate and interact with their constituents with regard to implementation of mitigation measures established as part of the plan. The Plan also proposes development of a public outreach component consisting of drought- related projects, educational-based programs, and development and initiation of statewide water conservation measures. In addition, the drought plan makes several recommendations regarding performance of risk management assessments pertaining to potential drought impacts. In April 2005, the Commission on Water Resource Management has updated the Hawaii Drought Plan with assistance from the U.S. Bureau of Reclamation. The HDP has been forwarded to Reclamation for consideration of submission to Congress under Title II, Reclamation States Emergency Drought Relief Act of 1991, as amended (P.L. 102-250 and 106-566). The HDP is intended to be a living document and will be updated from time to time as new information becomes available or as updates become necessary.